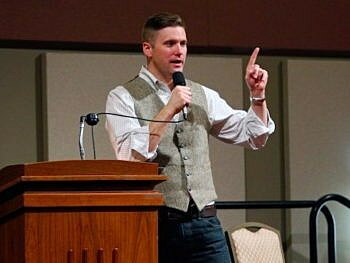 (Courthouse News) The IRS has returned tax-exempt status to a white nationalist group that for years did not file tax returns, group leader and Whitefish resident Richard Spencer announced. With a mission statement to “elevate the consciousness of whites” and “study the consequences of the ongoing influx that non-Western populations pose to our national identity,” the National Policy Institute is a 501(c)(3) nonprofit founded in 2005 by publisher William H. Regnery II. Though the end of tax-exempt status for the Alexandria, Virginia-based nonprofit happened automatically in March 2017 — triggered by its failure to file tax returns for three consecutive years — Spencer told the Associated Press that move felt retaliatory. “When we lost it, it did feel like persecution, to be honest,” said Spencer, whose group has sponsored several events in northwestern Montana in recent years and who has longtime ties to Whitefish and Kalispell. Spencer serves as the group’s president and is recognized for having popularized the term “alt-right,” sanitizing the embrace within conservative-extremist groups of white nationalism and anti-Semitism. In 2016, he considered running for Montana’s sole seat in the U.S. House after Republican incumbent Rep. Ryan Zinke was appointed Interior secretary by President Donald Trump. He claims Whitefish as his home, although he lives most of the time in Texas and Virginia. Though he did not return an email seeking comment, the AP quoted him as describing the restoration of tax-exempt status for his group a “nice, small victory” following recent dealings with online payment processors. PayPal and Stripe banned Spencer last year in response to his association with the Unite the Right rally in Charlottesville, Virginia, that ended in the killing of counter-protester Heather Heyer. Before Heyer was run over at the rally by James Alex Fields Jr., a white nationalist who espoused a personal appreciation for Adolf Hitler — Spencer had been scheduled to give a speech to supporters. Spencer blamed his group’s missing tax returns on an error from 2006 or 2007 wherein the IRS mistakenly reclassified the National Policy Institute as one that didn’t need to file tax returns. Its loss of tax exemption was made retroactive to May 15, 2016. An IRS spokesman said he could not comment on the change, but Spencer told the AP that they “went through a long process” to earn reinstatement. “They’ve looked through everything, and we came out fine,” he said. Between 2007 and 2015, according to the AP’s tally, the National Policy Institute collected $697,267 in tax-deductible contributions.